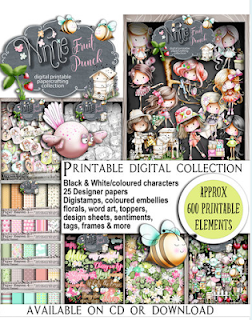 Paper, Pens and Pretty Things : Winnie Fruit Punch Facebook Launch Party! Just popping in to let you know that there is a party in full swing over on Facebook to launch a brand new Polkadoodles collection called WINNIE FRUIT PUNCH. It is just too cute and I made this side stepper rocker using some of the gorgeous pre-coloured elements from it.